This week we have a diverse group of wines from across the wine world. Join us in the store from 5-8pm on Thursday, January 17 for a few delicious sippers from France, Chile and Lebanon. 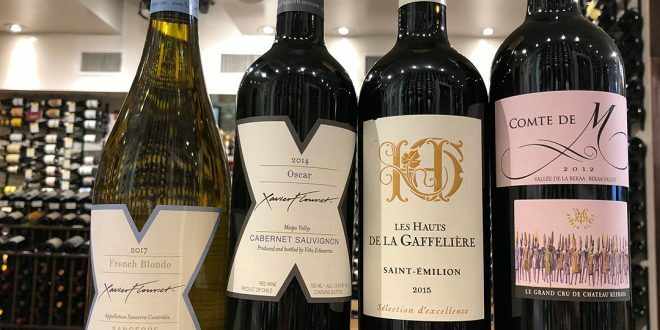 Xavier Flouret is a carefully curated collection of some of the world’s finest wines. Flouret had selects each wine, choosing only expertly made wines that highlight their terroir for his premium portfolio. 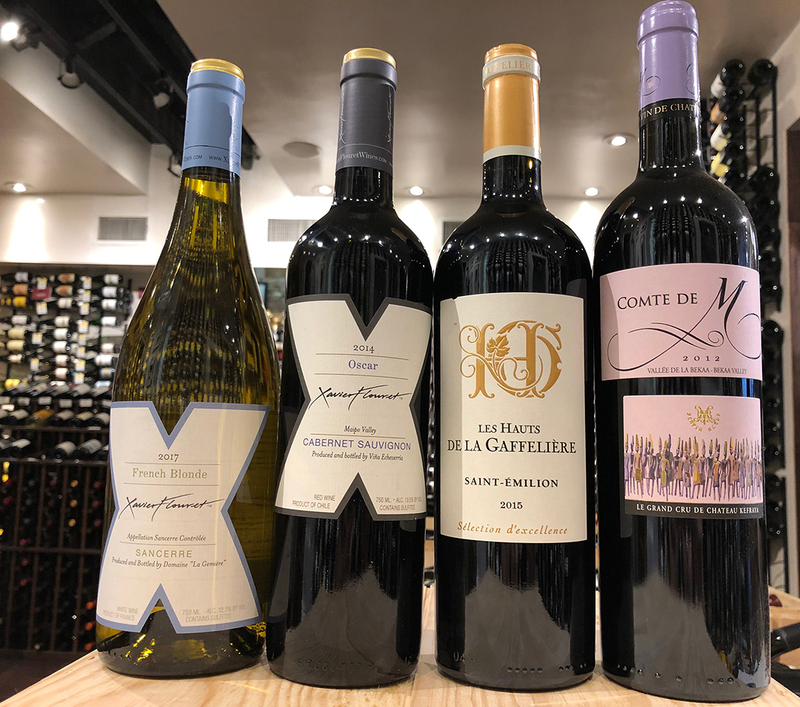 The recognizable “X” label can be found on 12 different wines, stemming from the best wine regions in 7 different countries. Tonight we will be tasting the Oscar Cabernet Sauvignon from Chile and the French Blonde Sancerre from France. The Oscar is made up of 85% Cabernet Sauvignon, 10% Petit Verdot and 5% Malbec from the Maipo Valley that flourish in the alluvial soil and Mediterranean climate. This wine has intense aromas of strawberries, cherries and violets. The palate is round, silky and juicy with a delicious finish. The French Blonde is made from 100% Sauvignon Blanc grown on pebbly terrain made up of clay, limestone and white soil known as La Caillote. The wine is balanced with equal parts fruit, minerality and acidity. The wine bursts with notes of floral and fruit aromas, while hints of apricot and pineapple shine through on the predominately citrus palate. Located in the heart of Saint-Emilion, Château La Gaffelière has been making wine since the beginning of the 17th century. The winery boasts 79 acres of vines including 54 acres of Grand Cru Classé. The vineyards are spread across three specific areas of Saint-Emilion with differing terroir allowing for the nuances of the land to shine through. The Les Hauts de La Gaffelière is made up of 75% Merlot, 15% Cabernet Franc and 10% Cabernet Sauvignon. The wine comes from vines that are 25 to 30 years old from clay, limestone and sandy soils. It is a full-bodied wine with soft tannins, a touch of licorice and black fruit on the palate. Château Kefraya has been owned by the Bustros family since 1979. Located in the Bekaa Valley on the foothills of Mount Barouk in Lebanon, this estate has a great diversity of soils. The Comte de M is a blend of 82% Cabernet Sauvignon and 18% Syrah. These grapes are selected from the best areas of their vineyard with clay-chalk soils. The wine bursts with aromas of fresh fruit, spices, chocolate and a hint of smoky, wood notes. On the palate the wine is powerful and complex. With a full body and well structured tannins, this wine is perfect for meat dishes, truffles and aged cheese. Thursday, January 17, 2018 from 5pm to 8pm. We believe tasting wines side by side is always a great way to learn and appreciate the differences and similarities! Our complementary tastings run in-store every Thursday from 5pm-8pm. To sweeten the deal, we’ve discounted all the wines being poured that day!